Our volunteers make it happen! We are an all volunteer, nonprofit group committed to rescuing domestic rabbits and educating people about the joys of living with a house rabbit. Without the dedication of our volunteers, it would not be possible to care for and re-home the many bunnies that pass through the sanctuary. We welcome compassionate and reliable volunteers to assist our rescue group. You'll have fun and make a difference right away in the life of a lonely animal! Volunteer opportunities take place on Saturdays. Please note, due to the nature of the work, which involves heavy lifting of hay boxes, pellets, litter, and cage cleaning, volunteers must be at least 13 years of age. If you would like to explore volunteering, contact us at ntrs_tx@yahoo.com, and we will be in contact with you. 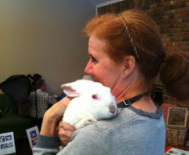 Thank you for your interest in volunteering with the North Texas Rabbit Sanctuary!